So you made it through the first week with a wing and a prayer, but what do you need to get through the rest of the school year? 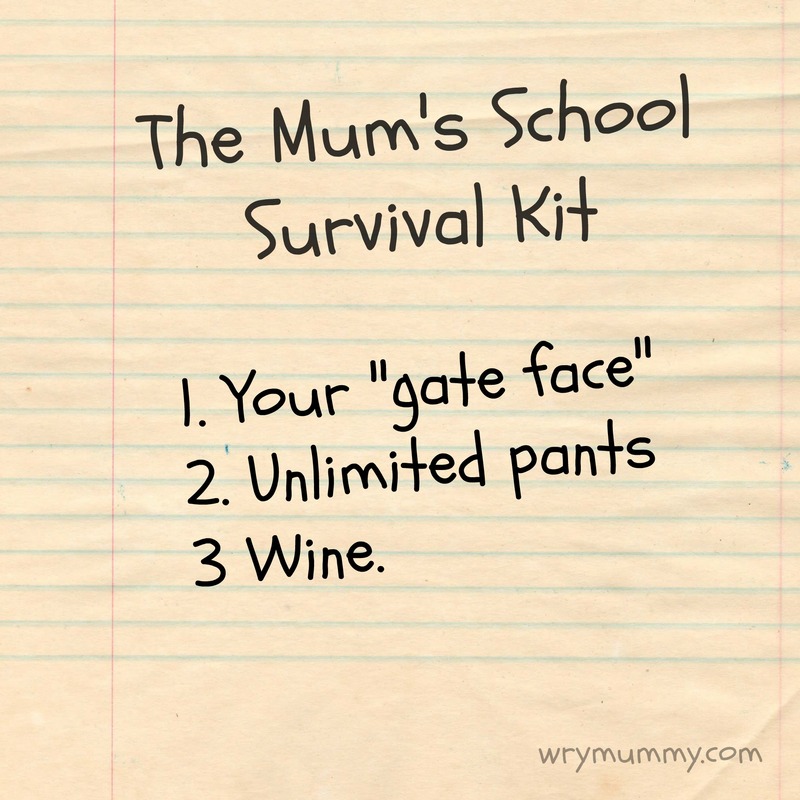 Now the first week’s weeps / whoops are over, it’s time to work on your schoolgate face. To arrange your features into an acceptable expression to greet friends, strangers, teachers and children alike. In short, to look “normal.” If that is how you want to appear, of course. The key is to look receptive (open to meeting parents you haven’t come across yet), unsurprised (when you realise you had a lengthy chat with them last week which they, unlike you, recall perfectly, damn them), calm but not serene (that just annoys everyone); and like you’re looking back at your child till the very last second before they disappear in the door (not chatting about the weekend or checking out Fit Dad). Excesses of emotion should (I’ve found), be kept off your features to avoid looking deranged (even if you feel like it). The tears of rage induced by lost keys / book bags / single shoes / teeth-cleaning battles / undoing of seatbelts while moving / refusals to walk a step further must be rinsed from your face as soon as the school gate hoves into view. Perkiness is perfectly acceptable; effusive joy just annoying at that time in the morning. Sod sewing in nametapes. Name stickers also excellent. You’ve got all their uniform assembled, you’re nailing it…then you realise you’re out of pants. How this can be when you do 18 loads of washing a day is unknown, but I guarantee it will happen one day. A “child’s artwork storage plan”. Whether you store your kids’ creations on the fridge, in colour-coded A3 folders or that big shiny “storage device” in the corner of the kitchen, decide on your plan so you don’t waste minutes dithering over every splodgy scene that comes home. Whatever you do, make sure you know your drill by Christmas, the mothership of child’s craft. A “School Crap” email folder. If you already have a child at school, you’ll know what I mean. If you’ve just started – prepare to be amazed. Sick bag. In case you’ve had one too many the night before and the school stress tips you over the edge. Also useful for children. Balls of steel. Someone might be mean to your child. Teacher, child, whoever invented Maths. You will have to take this on the chin and / or deal with this as appropriate. Uncompetitive attitude. Hard, hard, bitter hard as this may be to muster, the path of “which reading band / Nativity part / tiddlywinks team / Kumon group is s/he?” leads only to despair. Car chocolate. ESSENTIAL. Preferably pre-loosened so you don’t make any telltale wrapper noise. Your pre-baby brain. You know, the one that knew stuff. Like 8×7, and where the hell everything is in this house. For more wry notes on family life, why not take a look at my Facebook page? My eldest just started reception and I’m already recognising some of this. Very funny!